I recently joined a Chicago Meet-up Group called Spiced-Up that meets once a month for a BYOB restaurant meal and has a monthly pot-luck involving a specific spice. I joined too late for the April clove potluck (drat the luck), but was in time for a lovely meal at Cookies and Carnitas and the May potluck, the theme of which was peppercorns. I have mentioned before that pepper was not much in evidence in our house when I was a child. My mother did not care for it. All of our salt and pepper shakers were filled with salt, and whenever we came across pepper in a recipe we were making we simply ignored it. My father was a closet pepper eater, though. There was always a jar of coarsely ground black pepper in the spice cupboard that he would use whenever he thought he could get away with it, usually when he cooked meat. So I was at least familiar with the taste even if I was not a particular fan. Over time I came to appreciate its flavor on certain foods, mainly eggs, but I never noticed it's absence from any dish. In the past ten years or so, however, I have gotten into the habit of using it more often than not when I cook. After my first internal groan of dismay when I saw that the theme for my first potluck with this group was peppercorns, I chose to take the high road and see it as an opportunity to find a new way to appreciate it. I was reminded of a caprese salad I had ordered years ago at Topo Gigio in Old Town. The tomatoes were summer ripe, the mozzarella was soft and luscious, and the basil was fresh and flavorful. But of all things it was the pepper that stood out to me. To this day I don't know what kind it was - I don't think it was Tellicherry but I could be wrong about that. For sure it tasted like pepper, but it had an extra special sharp - peppery - bite that I had never before encountered. It was the only time that I can ever remember where I actually noticed the pepper as a separate, essential ingredient, and I decided it was no accident that it had occurred with such a simple dish. That memory inspired me to look for another simple dish that might benefit from the addition of that peppery kick. And it didn't take long for me to come up with one. As soon as I had the thought of adding coarsely ground black pepper to curried ginger carrot soup I knew it would work. And it did. On its own the soup is quite good; good enough that it is something I make regularly. But the addition of the pepper causes the carrots to pop into the foreground while the rest of the spices combine to balance the rest of the flavors. It was well received at the pot-luck and would make a great starter for a dinner party, but is awfully good for lunch with a grilled cheese sandwich. If you do not have all of the spices readily available, you can just use a tablespoon of curry powder, or to taste. Just be careful not to overdo it, or the curry spices will overpower the pepper. And that would be a real shame. Bring an inch of water to a boil over medium-high heat in a 3-quart saucepan. Add a teaspoon of salt and the carrots and cook for about 10 minutes, until tender. Drain, reserving liquid; set both aside. Heat the oil over medium heat in a large pot. Add the onion, garlic and ginger and cook, stirring frequently, until the onion is translucent. Add the spices and cook until fragrant but not burned, about 1 minute. Add the carrots and stir until they are coated with the spices. Add enough broth to cover the carrots. Cover, lower the heat and simmer until the vegetables are tender, 10 to 15 minutes. 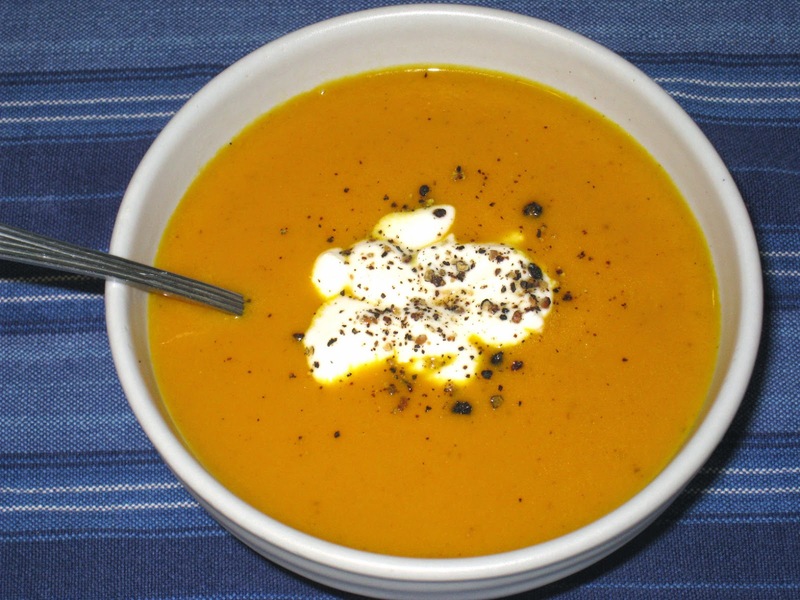 Using a stick blender or a regular blender, puree the soup. If using a regular blender, return the soup to the pot and place over low heat. Add the rest of the stock. If more liquid is needed, use the reserved liquid from cooking the carrots. Add the coconut milk and black pepper and season to taste with the salt. Serve hot, garnished with yogurt and more black pepper.